Today I received the following email from the good folks at Bookshare, which I wrote about in September of 2012. I feel so strongly about what they are writing about that I feel compelled to share their email with all the Tek-Ninjas out there. Please take a moment to read this, and if you feel compelled as well, sign the treaty! It’s not typical for us to send you an email like this, but we felt this situation was so important it was necessary. You may already be aware, but for years negotiations have been moving forward on what many have come to call the "Treaty for the Blind." The goal of the international treaty is to make it possible for people who are blind, or have other print disabilities such as dyslexia, to get access to the books they need for education, employment and inclusion in society—no matter where they live. It's something we already do, with great success, in the United States through Bookshare. However, private interests are trying to alter the treaty in such a way that it would become useless—even harmful. For example, they’re trying to get language adopted that basically says: “if you can buy it, you can’t borrow it.” This is not only an attack on people around the world with print disabilities—it’s also an attack on libraries, like Bookshare, and could have a drastic effect on the number of books you have access to. Our biggest worry is this becoming a treaty that could stop Bookshare from serving our users in the United States the way we do today. We need our government negotiating for a treaty that supports a library like Bookshare. That’s why we’re working with a coalition of disability and library groups, including the National Federation of the Blind and the American Council of the Blind, to fight back against the proposed changes by these private interests. We’ll do everything we can to secure a treaty that both protects the access we have now and that will benefit people with print disabilities around the world—but we need your help. We’re asking you to take a moment to sign a petition on the White House’s website that urges the President to step up his support: http://ow.ly/lkJVs. If we can get to 100,000 signatures, the White House is required to respond to the petition and will, hopefully, take positive action. With your help we know we can reach that number. We also recommend the petition at the National Federation of the Blind’s site, which is particularly accessible. Thank you for your time and support. Together, we believe that our collective voice can make a real impact. Well, here is something I had not seen before. One of my students decided that she wanted a personalized iPad cover. Evidently she has experience in creating Duct-tape crafts, and so she applied this skill to making a one-of-a-kind iPad cover. She went so far as to make all the necessary cutout slots for the charger, the camera, sleep button, and headphone jack. Pretty nice work! The back flap folds to make a stand, or to cover the glass for transportation. I wonder if others have made their own covers? I don't know about the rest of you, but I essentially don't "type" with my iPad, but rather I "text". The keyboard looks like a keyboard, but it doesn't feel like a keyboard. I hold the iPad like a giant iPhone and type with my thumbs. This is because there is no tactile information, and so typing by touch feels impossible. I don't necessarily want a big keyboard to bring with my iPad, as that defeats the whole point of the elegant tablet. So ultimately, if I have a significant amount of writing to do, I wait until I'm at my desktop. Approximately a year ago a colleague brought to my attention an interesting Kickstarter site for an unusual keyboard. 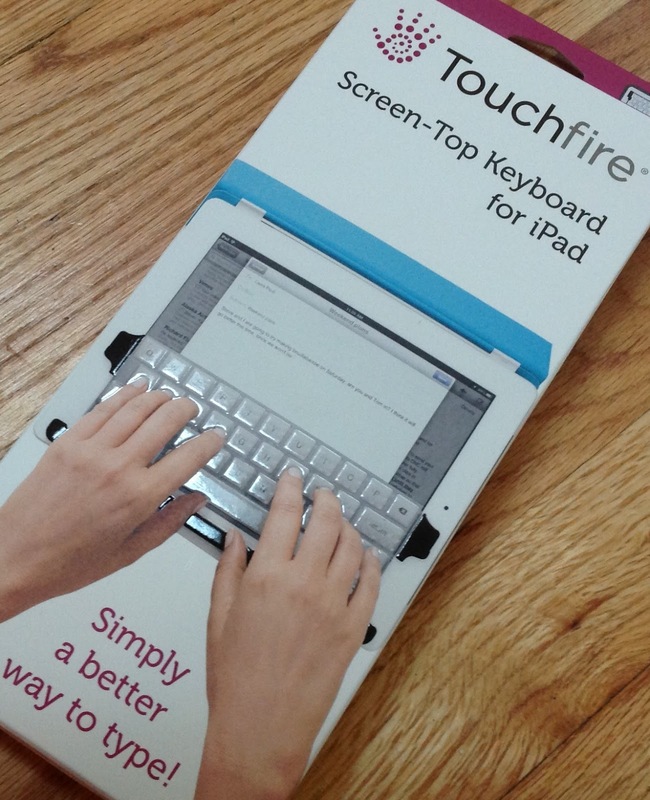 The product was called the Touchfire, and it was to be a silicon overlay for your iPad keyboard, essentially providing you with tactile feedback as you type. We bandied the idea back and forth, thinking it interesting, but then moved on to problems that were facing us. Almost a year later, reading a tech blog, I ran into the Touchfire again. Only now, it's a product that is available for consumers. When I realized it was available, I was intrigued again, and went to their website to learn what I could about it. The Touchfire retails for $49.95, and ships within 24 hours. You can purchase the keypad straight from the website. What you receive is the silicon keypad, a carry-case, and magnets to attach to your smart-cover if your using one. The keypad is as thin as two credit cards and weighs just 3/8 of an ounce. The Touchfire seems simple, and on one hand it is... after all, it's just a clear piece of silicon right? Well, yes and no. The high-grade silcon is very durable. It wipes clean easily. The keypad is compatible with all four generations of iPad. In addition it is compatible with Canadian French, Catalan, Cherokee, Chinese Simple, and Traditional Pinyin, Chinese Traditional Cangie, Croation, Czech, Dutch, English, Estonian, German (QWERTY), Hawaiian, Hungarian, Icelandic, Indonesian, Italian, Japanese, Romaji, Korean, Latvain, Lithuanian, Malay, Polish, Portuguese, Romanian, Swiss French, Serbian Latin, Tibetan, Turkish, and Vietnamese keyboards. The Touchfire keypad is like typing on my computer, but a little gentler. 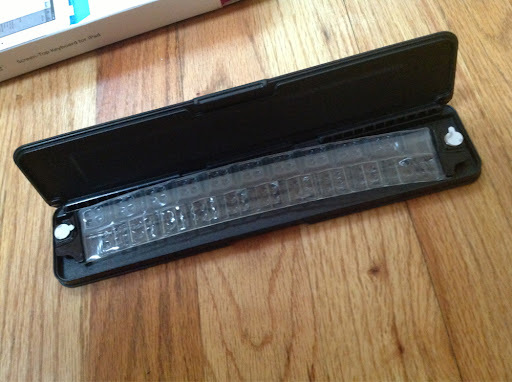 Turns out the silicon is nicer to strike (I am a rather aggressive typist) than my normal keyboard. The keypad is a tad more sensitive then my typical one, and there was a small learning curve to ease up a bit, but after just a few minutes I was typing at my normal ferocious rate! Folding the keypad out of the way is easy to navigate the full iPad screen, but I found it even easier just to take the keypad off and put it back on when I needed it. I also use a Smart-Cover and found the keypad rolled up nicely in it. I think the Touchfire is a great add-on that will make the iPad a viable writing tool. It's light portability will appeal to folks who really want to keep the iPad lean and streamlined. I've written this blog using the Touchfire and have been pleased with it's performance. My intention is to keep using the Touchfire for awhile and I hope to report back in several months regarding it's resilience under heavy usage. Assuming that it is as durable as I hope, the Touchfire can definitely contribute to our students with special needs utilizing an iPad to access their curriculum. Hey Tek-ninjas! When I originally began playing with the idea of writing a blog I had no idea I would become so engaged with the process. Consequently, when I came up with the address I did not really give it any thought. Some of my readers have asked me what the heck does "Shinobijimbo" mean? If you've read my bio, you know that I practice martial arts. Ninjutus to be specific, which is the artform of the Ninja. A shinobi or a ninja was a covert agent in feudal Japan who specialized in unorthodox warfare. Assistive Technology (AT) is sometimes thought of as an unorthodox way of approaching education, and the best AT blends in so well, as to almost be covert. Jimbo is a name some of my childhood friends gave me. Hence, shinobijimbo. It seems though, with increased readers (yay!) that the name is an obstacle. I can never just say the address to an individual without spelling it out several times. It's not catchy to say the least! And having "blogspot" in the middle is not ideal. So, I bit the bullet and bought a domain name. You may have noticed it up top! You are now reading Tek-ninja, at www.tek-ninja.org! Don't worry, if you've saved the site as www.shinobijimbo.blogspot.com, it will still come to the site, and then it will change the address. One of my most significant "take aways" from the WATI (Wisconsin Assistive Technology Institute) conference I recently attended was an introduction to the iPad and Android app Avaz for Autism. According to the company, Avaz is "a research-based AAC app, specially developed for children with autism. Avaz was designed in collaboration with hundreds of experts: parents, speech therapists and children." I would add that Avaz could work well for any user struggling with communication and needing an alternative voice. This review will look at the iPad version, as I have little to no experience with the Android OS. Let me begin by saying how pleased I was with the intuitive layout, and ease of use. Avaz is ready to work and play immediately. When you first open up the app you are presented with very simple tutorials that are more than sufficient to get you started using the app. Or you can by-pass the tutorials and plunge right in. Avaz for Autism very easily alternates from a keyboard to picture symbols. 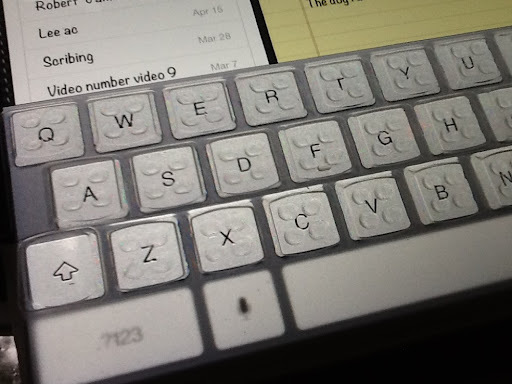 There is a word prediction bar that works well with the keyboard, and the keyboard can be QWERTY or ABC. If the user has a common phrase, tapping the "Save" key on the bottom left makes it readily available anytime with the tapping of the "Load" key. Also of interest is the "Alert" key on the bottom right which makes a doorbell sound to alert folks that the user has something to say. That is a simple feature, yet so fantastic! Picture symbols come in folders. The user can very quickly and easily create new picture cards and new folders. Simply tapping on the "Edit" pencil icon on the top bar. It will turn red when in edit mode. Symbols and folders can easily be copied, moved, and deleted. It is easy to begin a message with a picture symbol, and then navigate to the keyboard to type a word or two, and then navigate back to the symbols. When your sentence is constructed, just tap the word bar up top, and the sentence will be read in a crisp and clear voice. I spent the better part of yesterday not using my vocal-voice, but rather Avaz to communicate with folks, learning as I went. I was able to walk around my building and create 5 icons of co-workers and place them in a folder named "Staff" effortlessly. I then proceeded to taunt, and banter with those lucky staff members with Avaz, thus proving how quick it was to learn! Another really nice and seemingly simple feature is the ability to send one's message straight to your Facebook, Twitter, or email account. On the left, note the message in the top left corner. That was easily sent straight from Avaz! Other customizable options include the ability to change the number of pictures per screen, change font size, change contrast, color coding, and auto-home. In addition there is a built in "Backup & Restore" function which links to a DropBox account. Just one more reason to get a free DropBox account if you don't have one already! I also really love that there are both adult and child US accented voices, adult male and female British voices, and an Indian female accent, for a total of seven different voices. So, if you are looking for AAC apps, Avaz for Autism may be just what you need. Currently it is on sale for $79.99 on iTunes, and it is $99.99 on Google Play. These prices may feel a bit steep compared to other apps, but that's apples to oranges, compare it to some other AAC apps, and it is almost half the price of other popular products. Or, compare it to dedicated AAC devices with integrated software (some of which sell for $9,000+) and it is a relative steal. Avaz for Autism is one of the most aesthetically pleasing, intuitive to learn, customizable and effective apps I've seen for our special needs population ever. "I used to think it would be hard to be an Occupational Therapy... And then I saw this step-by-step". This made me laugh. Ed Emberly would be appalled! It's a very funny image, especially when I think about it in the context of Occupational Therapy. Obviously, so many steps are necessary in between #1 and #2, and for many folks, that is where the mystery lies. My sister, Emily Keenum who is a contributor to the blog Acorn Dreams, noted that she often feels this way in life when faced with how to be a good parent, wife, employee, etc. It seems obvious that she is of course, excellent at all of those things! Yesterday, I attended a Conference called "Strategy Sleuths: Detecting Communication/AT Needs for Students with Autism Spectrum Disorders", with Shelly Weingarten and Jill Gierach from WATI (Wisconsin Assistive Technology Initiative). Our AT Team has utilized a lot of their tools as they make them available online and encourage teams using them. One topic they touched on, which resonated with my colleague and I, was the issue of follow through/delivery. 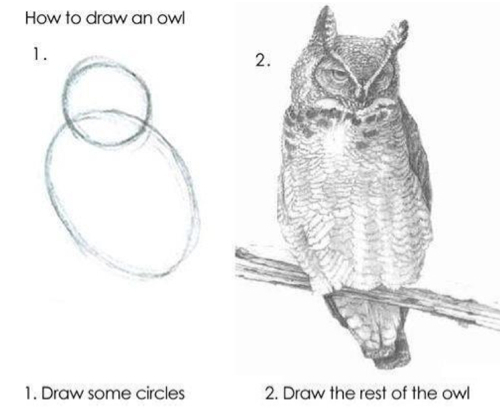 We want to make certain that when we deliver technology, staff/students/parents don't view the AT intervention as analogous to the cartoon above. Our team, like many, work from a consultative approach. We rely on the teachers, and related service people to provide the direct service. The take home message for me is that what may be obvious to me or my colleague, may not be so to the users. It is better to err on the side of too many steps in my step-by-step directions! I used to have a couple of co-workers who were proudly Teflon-like to learning technology. They agreed to be my "subjects" when I made step-by-step directions. We knew that if they could understand the directions, anyone would. My problem now, is that they are no longer so Teflon-like! When sending technology out to a user, it is crucial that sufficient training is put in place. in addition, be certain the team identifies who will do what in the process, and how success/progress will be measured. This insures buy-in from all participants.